They largely don't know, but the Republic of Gilead has its suspicions. In the sixth episode of The Handmaid’s Tale — “A Woman’s Place” — a Mexican delegation visits to negotiate a trade deal with Commander Waterford and other representatives of Gilead. As part of the pomp and circumstance, both viewer and Offred get hints at the cause of the mass infertility plaguing their world. It’s implied that pollution and non-organic farming lead to the escalating infertility, and Gilead’s efforts to curb both is attributed to better fertility rates among its Handmaids. In Gilead, the pursuit of a clean environment is intrinsically connected to what Serena Joy refers to as a “healthy and moral way of life,” which includes reducing carbon emissions and forcing its Handmaids to eat only organic food so that they can remain fertile. Gilead’s leaders would have people believe that it’s the marriage of moral righteousness and a clean environment — and a consequential blessing from God — that inspires fertility in its Handmaids. And while it’s a perverted, theocratic twist on what’s actually happening, the connections between infertility and environmental damage become pretty obvious at this point in the series. The Handmaids wash blood off the walls to impress the incoming delegates. There’s a reason why the episode opens on red-robed Handmaids washing blood off a stone wall. The so-called “moral righteousness” that’s spoken about so often can hardly be taken seriously when covering things up to impress foreigners is seen as a necessity. It’s proof that the government knows exactly how terrible its structure is, because what would the truly righteous have to hide? In flashbacks, we see that it’s actually Serena Joy (Yvonne Strahovski) who comes up with the premise of “reproduction as a moral imperative” as the basis of a new society. In the present day, when the Waterfords and other Gilead Commanders are trying to win over the Mexican trade delegation, they don’t flaunt Gilead’s GDP, military might, or the value of its currency (which is actually pretty bad, by the way). They flaunt their moral righteousness, their commitment to clean energy and organic crops, and most of all, they flaunt their reproductive success. Gilead’s entire focus is on its treatment of reproduction as a valuable — even marketable — resource. “Traditional values are at the core of everything we do here,” Commander Waterford says. Under the guise of that righteousness, the focus on procreation influences every political decision Gilead makes, from energy consumption to agriculture. Oranges are a big deal in Gilead. “We’ve transitioned to a completely organic agricultural model,” Commander Waterford boasts to the Mexican Ambassador Castillo. A talking head adds that the citrus orchards in Florida are doing “really well,” despite the ominous “new weather patterns” that are mentioned. Mrs. Waterford also points out that Gilead has “reduced its carbon emissions by 78 percent in three years.” They’re trying to impress upon the Mexican ambassador that Gilead is righting all of the wrongs that led to infertility in the first place. 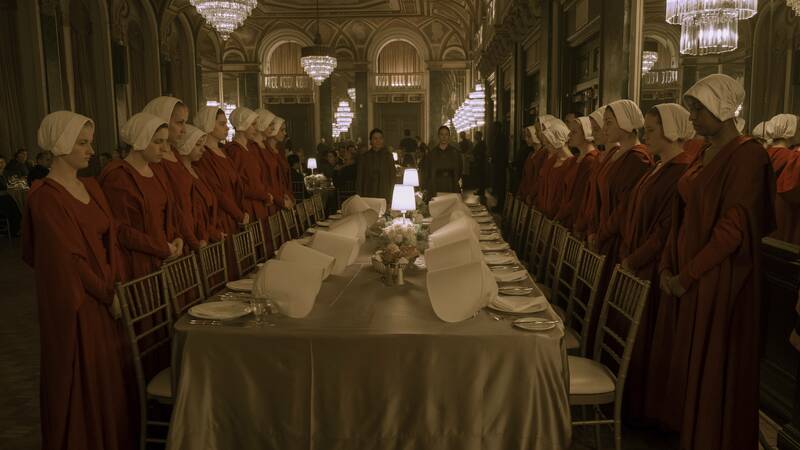 Later, at the banquet dinner that only the unscathed Handmaids are allowed to attend, Serena Joy speaks of Gilead’s “great strides cleaning the environment and restoring a healthy and moral way of life.” She also references the “most pressing problem” of all in their society, which is, of course, infertility. In Gilead, a clean environment is intrinsically wrapped up with their healthy and moral way of life. By their logic, God blesses Handmaids with fertility because of their green initiatives. There’s a reason why presenting the children of Gilead to the trade delegation is the final political maneuver in their trade efforts. It’s a wondrous sight for the Mexican ambassador, whose home has not seen a living newborn child in six years. She doesn’t care if fertility is a blessing from God or the result of eating organic oranges. She also doesn’t even seem to care when Offred unleashes the horrible truth about how Handmaids are treated. The fertility results speak for themselves in the form of a parade of laughing children. Ambassador Castillo just wants fertile mothers so Mexico can have its own children. The Handmaid’s Tale exists in a world where the threat of extinction inspires more than just the United States to throw morality out the window. The banquet scene in "A Woman's Place" was eerily unsettling. New episodes of The Handmaid’s Tale are released on Hulu every Wednesday.